Comments: Originally named "Mountain View" and now "Hatton Grange," this charming James River plantation is located 5 miles west of Scottsville. 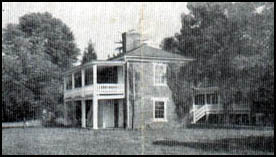 James Bruce purchased the plantation from Wilson Cary Nicholas, trustee of the estate of Dr. George Nicholas and an influential farmer in Albemarle County after the Revolutionary War. Bruce sold the land to Dr. Joseph B. Glover of Buckingham County on November 25, 1831. Shortly thereafter, Dr. Glover built the center portion of the house with six rooms, two halls, and a basement. The wings with their staggered gable ends were added later. A four-room brick cottage stands near the manor house, and once served as Hatton Grange's kitchen, dining room, and servants' quarters. The two photos at right show the Hatton Grange manor house (top) and cottage (bottom) as they appeared in the early 1900's. In 1847, Hatton Grange ownership passed to Dr. Glover's daughter, who had married James Mason, a prominent Scottsville banker and businessman. The Masons held wonderful house parties at Hatton Grange before the Civil War, and great gatherings of guests spilled forth onto the lush lawns. In 1865, as faithful servants protected the house from burning, General Sheridan's men burned the old mill at the foot of a hill near the manor house. The mill was rebuilt in 1868 and used for many years to produce water-ground corn meal. Later Hatton Grange became the home of Mason's son-in-law, William Meriwether Perkins. During the winter of 1905-1906, Archibald Douglas Kincaid visited Scottsville from Williams College in Massachusetts. His father, Dr. William Kincaid, was completing his Presbyterian ministry in Honolulu, Hawaii, and Douglas wanted to look at Scottsville properties that might help support his parents in their retirement. Douglas fell in love with Hatton Grange and with Lucy Holladay of Spotsylvania County, Virginia, who was visiting her Dillard cousins at nearby Chester in Scottsville. Shown at right are Douglas and Lucy in this 1916 photo taken at Chester. 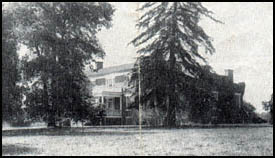 The Kincaids purchased Hatton Grange in March 1906 from Captain Cleland; the purchase price for the farm, equipment, and stock was about $28,000. Initially Dr. Kincaid served as temporary minister at Scottsville Presbyterian Church, but he soon received a full-time ministerial appointment at a church in Charlotte, NC. His son, Douglas, remained at Hatton Grange and courted Lucy Holladay. On October 22, 1907, Douglas Kincaid married Lucy Mason Holladay, daughter of James P. and Mary Eleanor (Dillard) Holladay in Spotsylvania County. 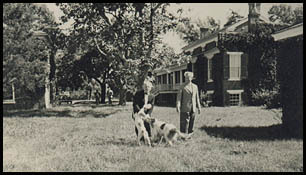 Douglas and Lucy lived at Hatton Grange for about a year before they, too, moved to North Carolina and left the farm to be managed for them by others. By 1911, Dr. Kincaid was deceased, and Mrs. Kincaid moved back to Hatton Grange with two of her children, Anna and William. Anna married Arthur Thompson in February 1911, and they lived with Mrs. Kincaid on the farm. The trio tried hard to make a living from the farm, but the 1911 drought forced them to sell and move to Herndon, Virginia. By 1918, Hatton Grange was sold again to J.W.M. Witten. 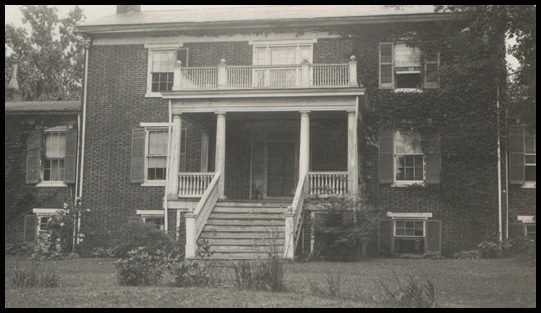 According to Eleanor Evans, granddaughter of Douglas Kincaid, Hatton Grange held fond memories for her grandparents and great-uncle, William. 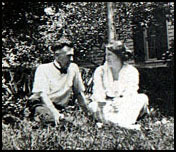 Douglas and Lucy Kincaid returned to Scottsville in 1916 to visit Hatton Grange as well as the Dillard family homes at Glendower and Chester. Shown here at right is William Kincaid, younger brother of Douglas Kincaid, who revisited Hatton Grange in the 1940s. These Hatton Grange photos are from the Eleanor Evans collection. Eleanor resides in Suffolk, Virginia, and is the granddaughter of Archibald Douglas Kincaid and his wife, Lucy Mason Holladay. The Kincaid family purchased Hatton Grange in 1907.